A simple rhyming book by Dr Seuss with a freewheeling plot about two children and the many astonishing creatures (real and imagined) they encounter. Dr Seuss writes more infectious rhymes which invite children to join in during storytime by filling in the words. This book explores a range of antonyms and basic concepts, such as new/old, fast/slow, and thin/fat. It’s excellent for targeting adjectives, particularly at the start of the story when the little boy is describing the different fish he sees (e.g. this one has a little star, this one has a little car). It's also ideal for children who are practising their /f/ sound in word combinations (e.g. black fish, blue fish, old fish, new fish). 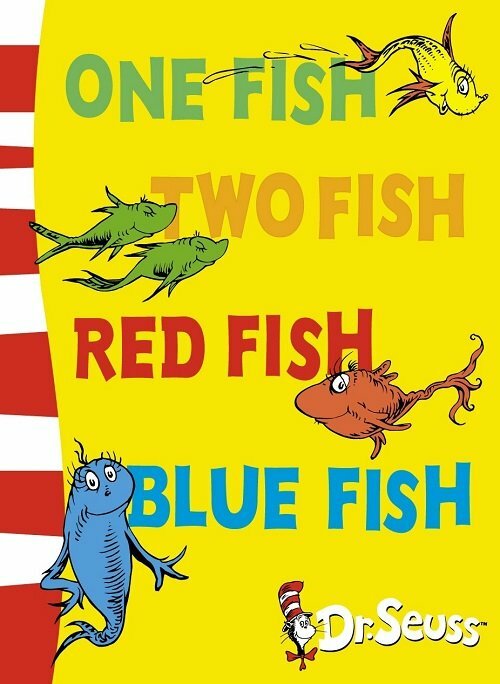 For further speech and language goals to target using One Fish, Two Fish by Dr Seuss, see the list below.